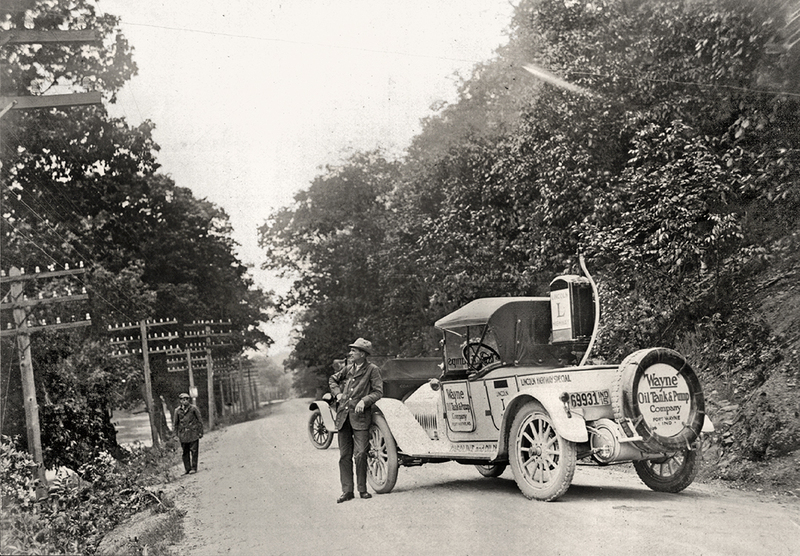 Lincoln Highway News | Stories and history from America's premiere coast-to-coast highway. The Golden Arrow Diner postcard has long been a favorite of Lincoln Highway and diner fans. The back lists it as “Lincoln Highway, US No 1, Langhorne.” After having written books on the Lincoln Highway in Pennsylvania, and Diners of Pennsylvania, I still had no idea exactly where it was located. The original books were written pre-Internet, so we now have the world of online resources. But it’s not THAT easy: one site, for example, listed it in 1953 at “City Line ON Roosevelt Blvd, Trevose,” another said “City Line ABOVE Roosevelt,” and yet another, “Roosevelt Blvd NORTH OF City Line” One post said across from a cemetery, another said the cemetery was behind it. Best I can tell, it was just southwest of Street Road (which is now Old Street Road, dead-ending at newer, wider Route 1). The diner’s name was registered by Emilio Ciotti in 1951. As the postcard back notes, the Golden Arrow was build by Comac in Irvington, N.J., a relatively rare make. Golden Arrow Diner, 1954. © Getty Images. The diner moved in 1967, though not far, and became the kitchen for a new, bigger venture of Emidio or “George” and Lena Ciotti: the Golden Arrow Restaurant & Cocktail Lounge Of Trevose, 3631 Street Road, Cornwells Heights, Pa. Check the map above for both old and new locations. Unfortunately we can no longer check — the Stadium was demolished in 2015, replaced by a park. Now, barely a block away, the Metro Diner serves customers from a modern shopping plaza. Final odd note — in 1994 there was an ad looking for workers for a Golden Arrow Diner on Rts 11 & 15, Shamokin Dam, Pa., and then a flurry of these ads in 1997. Then that trail goes cold too, more roadside history lost to time…. This story started simply: I had an old postcard of a restaurant in Aurora, Illinois, in my LH collection. The back lists the location as “US business Route 30” so I wanted to check if it was truly on the Lincoln Highway (which is not always the same as Route 30). As is often the case, there’s not a lot of info out there on a restaurant from long ago, but what remains paints a story of an interesting family business. Bit of Sweden Smorgasbord opened in 1955 on the east side of Aurora at 110 Hill Ave, on the southeast corner of Benton/Summit. It was across from today’s Hansens Motel, itself a vintage business still operating. Hill and Benton indeed served as the 2nd generation LH and later US 30. There was already a Bit of Sweden, closer to Chicago on Rush Road, that had opened about 1930. The Aurora restaurant — which would make sense to be related, though I could find no connection — was run by siblings Arvid (b. 1907) and Edith Nelson. For its next 15 or so years, it received a yearly profile in the local newspaper’s dining section. The largest profile, in 1960, described some of the food customers got for $2 buffet, including fish, roast spring chicken, Swedish meatballs, scalloped potatoes, baked ham, prime rib, Swiss steak, soup, and pickled herring. Homemade rolls and bread, dessert, and drinks were included, though no alcohol was permitted. The last profile ran in 1972; by 1975, the equipment was being auctioned … after the place had been converted to BoJangle’s Discoteque. There ends the trail, and story, of Aurora’s Bit of Sweden. It’s early September, 1919, and our cross-country travelers have finally reached San Francisco. The LHA had aimed to complete improving and marking its highway for the Panama-Pacific International Exposition in 1915; just four years later, almost nothing remained of that grand world’s fair. However, one odd connection to the fair remains: the California Palace of the Legion of Honor (now simply The Legion of Honor Museum) famously marking the end of the Lincoln Highway is a full-scale replica of the French Pavilion from the 1915 Expo, which itself was a 3/4-scale version of the Palace of the Legion of Honor in Paris. “The next day we were in the thick of the whirl. I did not consider our trip really ended until we stood on the sands of the Pacific. We motored through the city, out to the former Exposition grounds, where but a few buildings were left standing, and to the Presidio, one of the oldest military stations in our country, embracing an area of 1542 acres, overlooking the harbor…. “Driving through Lincoln Park, we entered Golden Gate Park, covering 1013 acres, with hundreds of varieties of plant life from all parts of the world, artificial lakes, boulevards, and the gorgeous flowers for which California is famed…. “The park extends to the Ocean Beach Boulevard, on the edge of the sands, where the breakers come bounding in against the Seal Rocks and the high promontory on which the Cliff House stands. The water is cold, and a dangerous undertow makes bathing unsafe, but the shore is lined with cars; hundreds of people and children are on the sand, and the tame sea-gulls are walking on the street pavement very much like chickens. The Cliff House was actually just the third, opened in 1909. It was closed in 1918 after a government order halted sale of liquor “within a half mile of military installations,” soon to be followed by Prohibition. Nonetheless that same building still greets tourists to this day.